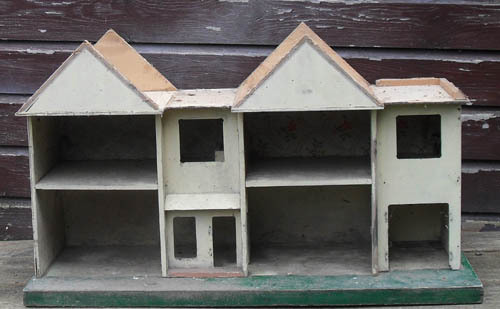 Triang No.77 – This is my next challenge, quite a big one I think, very basic only a wooden carcass no fittings apart from 4 window frames and garage doors to work with. I have had this house for a while, I bought it from a carboot sale for £10, it has been in my greenhouse providing spiders with a home. I was not sure if I was going to do anything with it, or not it is quite a large house. When I took these pictures I forgot to put the door panels up against the house, they have no hinges to hold them in place. This picture shows the two front panels, they have both been overpainted. The original paint shows up beneath it, but does not show any signs of flowers painted on them, I am sure this model has them. 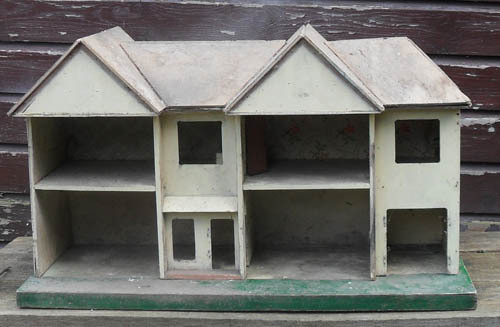 The frame of this house is in quite good condition, with very little woodworm which is good news. It has however suffered from a fair amount of water damage especially around the base of the house. 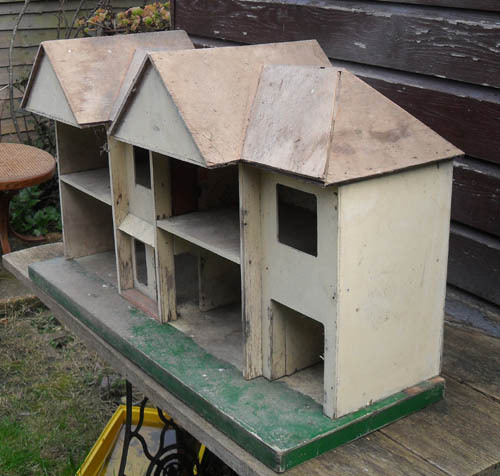 The green base is in very poor condition and is badly split, I will have to make a decision as to whether or not I will replace it as the house needs a good base for its size. I think it must have been stored in a shed or even a barn as it is so dusty and dirty. The roof has been replaced by a plywood one, which is a bit rough, and will need replacing. The roof is stuck down with glue so it should be fun removing it. 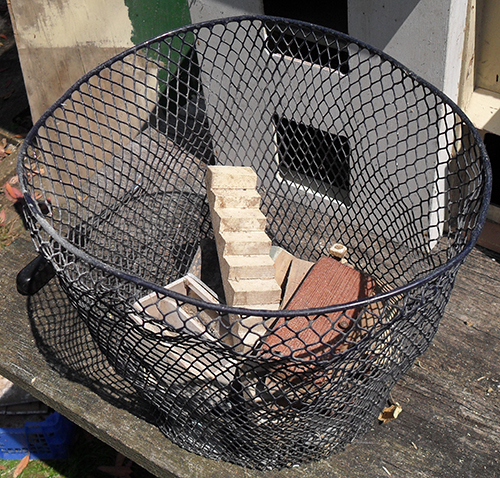 This is the basket that came with the house, it had the stairs in it and the garage door, also odd bits of furniture which has seen better days. 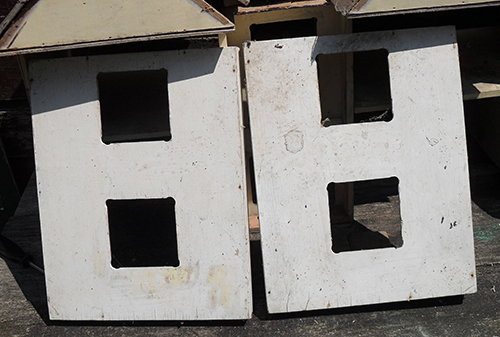 You could email your pictures to me – shedonthepond@gmail.com. 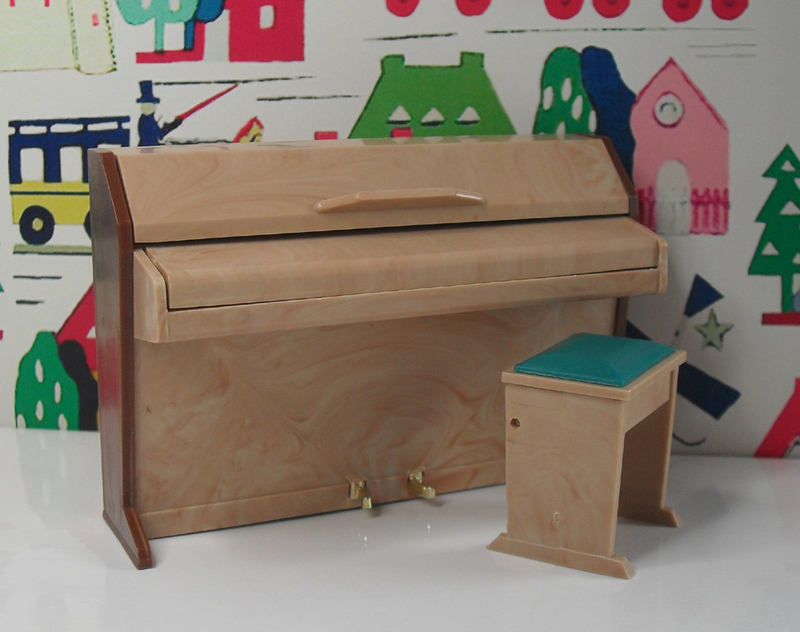 Well after a lot of hard work and very few tools and space the restoration of my Triang No.77 is nearly finished. I think it looks great, it was in a very poor state and is nice to see it looking great again and now to complement it, i have put some lights in. Just some last bits to do. That is brilliant. Hope mine turns out as good. Much ingenuity went into restoring the facade – looks like new. Seems like just the front door need sorting. Yes the front door needs a letter box, door knob and knocker, not sure what colour it should be. I also need to find a single window to go next to the door. Hi Lee same here mine needs Letter box and single window for next to door but all seem to be wrong size. Did they have door knockers ?. From other houses I have restored, it seems to be the smaller window [white frame] are fitted next to the door. I think it did have a door knocker. Original door fittings are quite hard to find, and quite expensive.